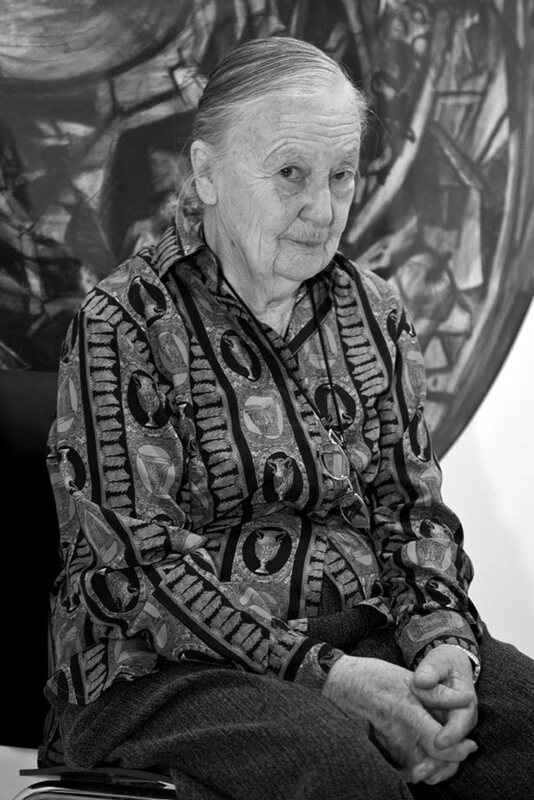 Pam Hallandal was an Australian sculptor, printmaker and draughtswoman, twice awarded the Dobell Prize for Drawing, who created works of great psychological insight and power over a period of almost 70 years. Hallandal was born in Melbourne in 1929 and was encouraged to study art by her father, an architect and amateur painter. When she enrolled at RMIT in the sculpture department after leaving school in 1946, she was discouraged from continuing due to her small physique and slight limp, the result of childhood polio. These physical challenges were countered by her quiet but fierce resolve, and she enrolled instead in the ceramics department, graduating in 1950. She went on to make sculpture anyway, exerting the uncompromising determination she was to exhibit throughout a life rich in artistic achievement. Between 1956 and 1958 Hallandal travelled through Europe visiting museums and undertook postgraduate studies in sculpture at the Central School of Art, London. Upon her return to Melbourne in 1958 she embarked on a long career as a teacher, first at the Prahran Senior Technical College, in ceramics and drawing, and later just drawing, reflecting her own practice which focused almost exclusively on drawing from 1970. She retired from teaching in 1994, having inspired and mentored a generation of Melbourne artists, including Allan Mitelman, Jim Paterson and John Scurry. Hallandal’s career spanned from her first exhibition – the Victorian Sculpture Society’s annual exhibition of 1949 – to a comprehensive retrospective – Watching – at the Art Gallery of Ballarat in 2016. Like many female artists of her generation – and one who focused on the less ‘privileged’ disciplines of drawing, printmaking and sculpture – she had a lower public profile than many of her contemporaries, but her work was highly regarded. Hallandal’s great subject was the human condition, with the human figure as a vehicle for imaginative, and empathetic, experience. Her subjects extended from those closest to her, to her fellow citizens of Melbourne in the streets, casino or supermarket, to those in the wider world caught up in disasters as seen on the television news, such as the 2011 Christchurch earthquake. She also captured simple subjects – objects or encounters observed in everyday life such as a motorbike owned by a noisy neighbour, the little dog who paced her house as quietly as she, lamb chops in a roasting pan, or kids playing in a schoolyard. Hallandal won the Dobell Prize for Drawing at the Art Gallery of NSW in 1996 with one of those self-portraits. She won again in 2009 with Tsunami , one of a series of works she created following the 2004 Indian Ocean tsunami that resulted in over 230,000 deaths. Both drawings are now in the Gallery collection, along with – among other works – portraits of her mother and an early series of linocuts she made when she was working mainly as a sculptor. Hallandal died on 25 September 2018 after a short illness, aged 89.